#3 (Prod #166143) "Blood Brother"
In Kilgore, Arizona Territory, following up a return address on one of Danny's letters, Caine discovers that an old friend from China has been there. The priest first seeks his friend, then his body, then justice. "The man who wrote it is my brother." (-Caine asking for information on one of the letters his grandfather gave him from his brother: when the postman looks at him with disbelief, Caine adds) "My half-brother." "'Enough!' -Caine, interfering with the harassment of another man from China. 'All right boys. Back up. Gently.' -a man from the town stopping the situation. "What is 'trespass?' ...I meant no offense.... I seek no trouble.... I hear what you say." -Caine, when accused of trespassing and then asked if he understands a demand that he leave town. 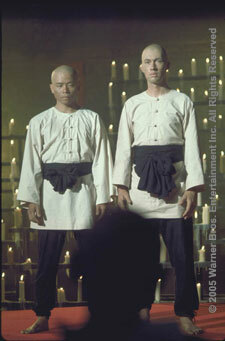 "He is a priest of the Shaolin Temple. A Shaolin priest can walk through walls. It is said that listened for he cannot be heard; looked for he cannot be seen; felt he cannot be touched." -about Caine and others like him. 'I wish you never had come.' -someone frightened of the fact that Caine stands up for himself instead of just accepting what the bullies do. "'Have you learned nothing?' -Caine asks the head of a Chinese family living in a small town. Quotations and other material copyrighted to Warner's Brothers, et al. Email bewarne@kungfu-guide.com to report mistakes, make comments, ask questions.